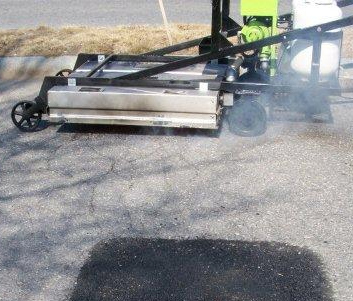 The infrared heat produced by the Mini-Tech Ready Mount penetrates very quickly and deeply softening the underlying asphalt without oxidation or burning. By raking in new hot material as needed to bring to grade, followed by proper compaction of this heated material, a thermal bond will be created to the surrounding area. Thermal bonding can provide better patches at a lower cost. Unique compact self contained design. Quick attaching method for transportation. Proven reliability, efficiency and profitability. 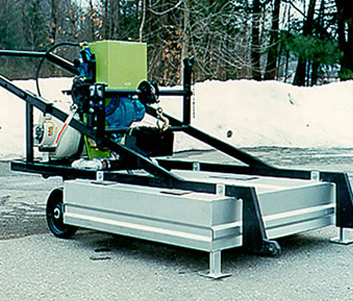 Ideal for sidewalks, playgrounds, driveways, parking lots, tennis courts and other small areas. Use for bridge joints and thermal bonded striping. 14 square foot heating area. (More with extended chamber options). Attaches to vehicle in less than two minutes. 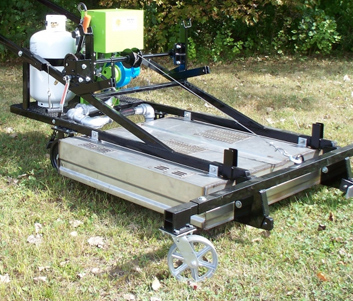 Compact – Easy one person operation.